"What is the prophetic significance behind the Czechoslovakian reform?" BIG events are shaking Czechoslovakia. Bible prophecy is being fulfilled. Here's what's happening. The spring meeting of the Communist Party Central Committee — Czechoslovakia's policy-making body was the culmination of three stormy months of governmental turmoil. It was held, as usual, in Hradcany Castle, but without the ever-present security guard! When the leaders of Czechoslovakia's Communist Party arrived, they were greeted by television cameras, flash-bulbs, and microphones. For the first time since the Communist takeover in 1948, no armed, militant guard was present to keep the reporters from openly, boldly, and pointedly, questioning their leaders. By the time the meeting had ended, the Central Committee had stripped staunch Stalinist Antonin Novotny of the last vestige of his power — his seat on the Presidium (the governing body of Czechoslovakia's Communist Party). But the purge didn't end there! What followed was a program of social, political and economic reforms that have had far-reaching effects on the other members of the communist bloc — and Western Europe. The new liberalized Czechoslovakian Cabinet, which met for the first time on April 12, agreed to allow Czech tourists more travel to the West. The reform has not only been political and economic, but religious, Read this UPI release: "The Communist Party's action program states that the 'freedom of assembly and association must be legally guaranteed and applied to various religious denominations.' Erika Kadlecova, new head of the State Church Office, also promised that 'all churches will be given equal rights and opportunities.'" The immediate USSR reaction was to call the new Czechoslovakian leader, Alexander Dubcek, to account for his actions, Dubeck reassured Kosygin that he had no intention of reforming Czechoslovakia out of the Communist sphere. As a safety measure Warsaw Pact troops went on "maneuvers" in Czechoslovakia. But this time there was no immediate suppression like that which followed the Hungarian uprising in 1956. All of the Soviet satellites in Eastern Europe are being affected by a new wave of nationalism. Thousands of Polish students demonstrated against their conservative Communist leaders. Although it is not likely that Poland will soon go the way of Czechoslovakia, the seeds of reform have been planted. The new reform has also been felt in Bulgaria. The conservative government there is also becoming concerned about the creeping nationalism that is affecting their communist brothers. Just over a year ago Romania broke the ice with the West by reestablishing diplomatic relations with West Germany! The cracks are suddenly widening in the once impenetrable Iron Curtain! 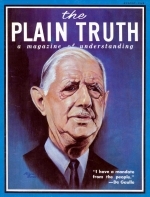 For years, the pages of The PLAIN TRUTH magazine, and The WORLD TOMORROW broadcast have been prophesying these very events, Read our booklet 1975 In Prophecy! We are fast approaching the end of this age! We need to be aware of the new turn of events in Europe! The Czechoslovakian Reform is one more step in the approaching birth of a United States of Europe. Bible Prophecy marches on! "Please explain the apparent contradiction between Mat. 27:5 and Acts 1:18. Did Judas Iscariot, after betraying Christ, hang himself, or just swell up and burst open?" The Bible doesn't contradict itself! Understand this. The Bible is deliberately written "here a little, and there a little" (Isa. 28:10). In God's revelation to mankind, He promises that He will not lie, nor will Scripture be "broken" through contradiction or otherwise (Titus 1:2; John 10:35). By putting together the two accounts of Judas' punishment, we get the whole picture. Both events are true — both happened. In Matthew's inspired account, God states that Judas "went and hanged himself" (Mat. 27:5). Luke was inspired to explain what happened AFTER that — AFTER Judas' body began to decompose. The corpse slipped from the rope and burst when it fell. This principle of Bible study can be applied throughout the Bible, solving many supposed contradictions. Write for our free article: "Twelve Rules for Bible Study," and our free Ambassador College Bible Correspondence Course, to understand your Bible better.